[20 points.] 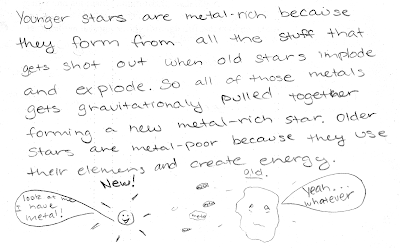 Discuss what observations tell you that a star is metal-poor, and whether this is an old or young star, using the properties and evolution of stars in your explanation. Correct. Discusses (a) how observations of absorption spectra classify stars as metal-poor, and (b) how production of metals in cores of massive and medium-mass stars is dispersed via type II/type Ia supernovae to be incorporated into the outer layers of subsequent generation stars. Nearly correct (explanation weak, unclear or only nearly complete); includes extraneous/tangential information; or has minor errors. One topic is complete/correct, other other is problematic. Contains right ideas, but discussion is unclear/incomplete or contains major errors. Only one of two discussion topics is complete and correct, the other is missing or has serious errors (typically spectroscopy); or both topics have minor errors. Limited relevant discussion of supporting evidence of at least some merit, but in an inconsistent or unclear manner. Discusses metal-poor stars as being old, but with conceptual errors; no discussion on spectroscopy. Implementation/application of ideas, but credit given for effort rather than merit. May discuss how metals are used to fuel a star; less metals would then indicate an older star that has used up all its metals. [20 points.] Consider a star with an apparent magnitude that is brighter than its absolute magnitude. 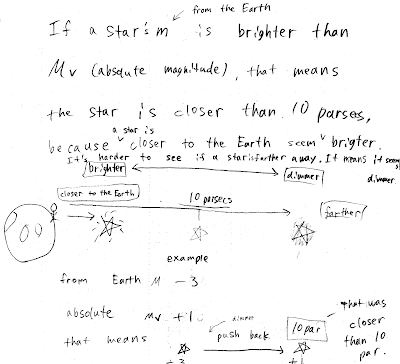 Discuss whether this star is farther than 10 parsecs, exactly at 10 parsecs, or closer than 10 parsecs from the Earth. Explain your reasoning. Correct. 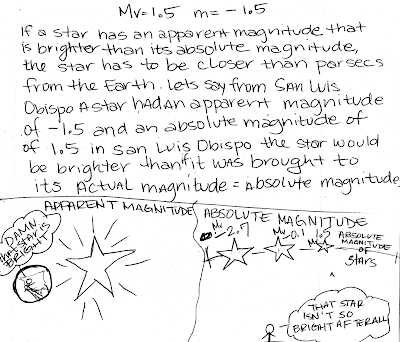 Differentiates between apparent ("as is") magnitude, and absolute ("true") magnitude, and explains reasoning as to why a star that seems brighter than it actually is must be closer than the standard 10 parsec distance in the absolute magnitude definition. Limited relevant discussion of supporting evidence of at least some merit, but in an inconsistent or unclear manner. May involve other factors such as the Stefan-Boltzmann law, lookback time caused by the finite speed of light, etc. [20 points.] A 0.500 kg point mass is dropped onto a disk rotating at 4.00 rad/s that has a mass of 0.700 kg and a radius of 0.150 m. The point mass eventually rotates with the disk at a distance of 0.100 m from the axis. What is the final kinetic energy of the disk and point mass system? Show your work and explain your reasoning. Correct. 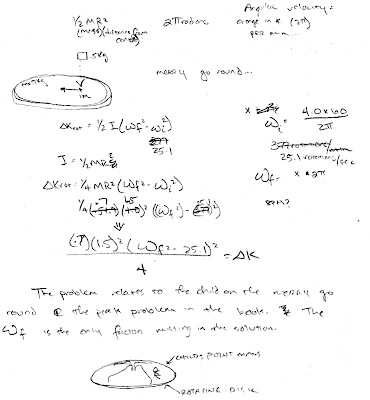 Applies conservation of angular momentum to find the final angular velocity of the disk and point mass system; and then calculates the change in initial and final rotational kinetic energies in this inelastic rotational collision. Nearly correct, but approach has conceptual errors, and/or major/compounded math errors. Some attempt at applying conservation of angular momentum before evaluating the final kinetic energy. Implementation of right ideas, but in an inconsistent, incomplete, or unorganized manner. 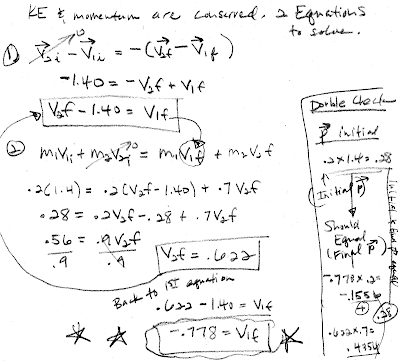 Applies kinetic energy conservation to find final rotational kinetic energy, even though this is an inelastic rotational collision (as seen in lab), and if it were elastic, the final rotational kinetic energy would be exactly equal to the initial kinetic energy. [20 points.] A 0.200 kg cart collides elastically with a 0.700 kg cart that is initially at rest. 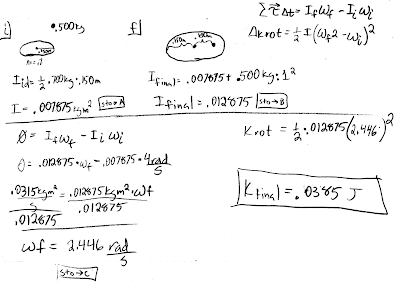 If the 0.200 kg cart was traveling in the +x direction at 1.40 m/s before the collision, what is the velocity (speed and direction) of the 0.200 kg cart after the collision? 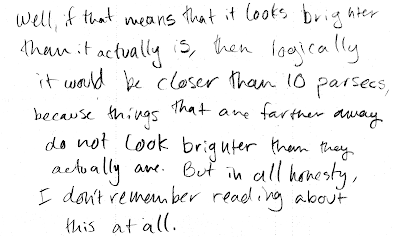 Show your work and explain your reasoning. Correct. Applies both momentum conservation and kinetic energy conservation for this elastic colllision, and finds both the magnitude and direction of the final velocity of the 0.200 kg cart. Nearly correct, but approach has conceptual errors, and/or major/compounded math errors. At least applies both momentum and kinetic energy conservation. Implementation of right ideas, but in an inconsistent, incomplete, or unorganized manner. Typically only attempts momentum conservation. Cuesta College Astronomy 210L students and guests from both North County and San Luis Obispo campuses during a North County campus star party. The SLO campus students made the inevitable In-n-Out Burger stop on the way back down the Cuesta grade. Which feature on the Moon is the oldest? (A) Craters partially filled in with flat lava plains. (B) Craters on top of flat lava plains. The principle of superposition from geology holds that the bottommost layer must be the oldest geological feature. __________ is/are evidence of reionization in the early universe. (A) Galaxy redshifts are proportional to galaxy distances. (B) The near zero curvature of space-time. (C) The amounts of helium and lithium in extremely old stars. (D) Extremely distant galaxies surrounded by neutral hydrogen gas. (E) The cosmic microwave background. Reionization occurred when the first generation of stars formed the first galaxies, at the end of the dark ages. The light from these stars ionized hydrogen around them, creating emission nebulae. A __________ main sequence star will eventually become a neutron star. Massive stars main sequence stars will become supergiants, undergo type II supernovae explosions, and then can either become black holes or neutron stars, depending on the mass of the remaining core. (D) Blue-hot main sequence stars. (E) Yellow-hot main sequence stars. Massive stars (blue-hot main sequence stars, which become supergiants) evolve faster than medium mass stars (yellow-hot main sequence stars, which become giants, then white dwarfs), which evolve faster than low mass stars (red dwarfs). Thus blue-hot main sequence stars will be the youngest type of stars, and be found in extremely young stars clusters. A main sequence star will be ___________ compared to a giant star that has the same luminosity. From an H-R diagram, main sequence stars are hotter than giants that have the same luminosity. From the Stefan-Boltzmann law (luminosity proportional to size and temperature^4), since the main sequence star has the same luminosity as, but is hotter than the giant, then the main sequence star must be smaller in size. A string and a wire are each 10.0 m long, and are stretched by the same tension of 30.0 N. The string has a mass of 2.40×10–3 kg, and the wire has a mass of 1.90×10–3 kg. Transverse waves on a string or wire is given by v = √(F/(m/L)), where both strings have the same tension F, but have different linear mass densities ("thicknesses") (m/L). Since the wire has a smaller mass per length, waves will travel faster along it. [3.0 points.] A wire of length 3.00 m with a cross-sectional area of 1.80e-5 m^2 stretches by 0.00250 m when a load of 2.00e+3 N is hung from it. What is the Young's modulus for this wire? Hooke's law is (F/A) = Y*(delta(L)/L), so Y = (F*L)/(A*delta(L)). Response (A) is (F*delta(L))/(A*L); response (B) is (F/A), and response (C) is (F*L)/A. Tracker chart for the Galilean satellites of Jupiter, adapted from the "Jupiter Moon Tracker Results" data from the NASA Planetary Rings Node website (http://pds-rings.seti.org/tools/tracker2_jup.html), used to determine the mass of Jupiter using Kepler's third law. [4.0 points.] What makes it possible to observe the very early universe, just after the start of the big bang? (B) Curvature of space-time in the universe. (D) Finite speed of light. The finite speed of light means that it takes time for light from distant objects to reach the Earth. Thus looking at an object a given number of light years away means that it appears as it did that same number of years in the past. This is used to great advantage when observing extremely distant objects nearly as far out in light years as the universe is old. Apparently students successfully discriminated against the dark energy distractor. 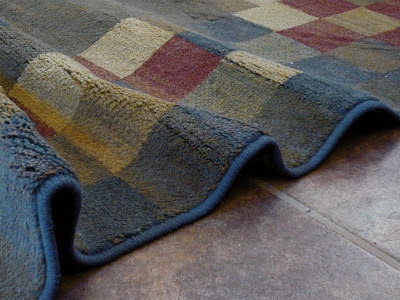 Carpet wrinkles, simulating a folded mountain range due to motion caused by plate tectonics. How do we know that the Milky Way is shaped like a flat disk? (A) Statistically, most other galaxies are shaped like flat disks. (B) Distant stars appear to be dimmer than nearby stars. (C) Naked-eye observations at dark sky locations. (D) The precession of the axis of the Earth's rotation. Since the stars of the Milky Way form a band across the night sky, as seen from Earth, its overall shape must be thin and flat, as opposed to spherical. Apparently all students successfully discriminated against the dark matter distractor. Cooper Cooler(TM) apparatus in action for testing the hypothesis that an off-center impact on Uranus, which may have tilted its axis, would have also cooled it adversely due to stirring its interior, compared to Neptune, which would have remained relatively static, and cooled off at a slower rate. Two bottles containing equal amounts of warm water at the same initial temperature are either put into a Cooler Cooler(TM) beverage chiller, and spun while deluged by a cascade of ice water, or placed in a static ice bath for an equal amount of time. Afterwards, the final temperatures of the two bottles are compared. Raw spinach leaves versus cooked spinach leaves, as an analogy for meteorites containing carbonaceous chondrites (volatile materials which would not survive extensive heating, and thus may represent a sampling of the early solar nebula), versus achondrite meteorites, which lack volatile materials (and thus experienced extensive heating in its past). Found physics: "Turkey/Cornish Hen Effect"
The "Turkey/Cornish Hen Effect," illustrating the effect of mass on thermal capacity. Low-mass objects cool off much quicker than massive objects, which cool off at a slower rate. Cuesta College Astronomy 210L students Nadia and Mary use digital cameras to take pictures through the eyepiece of one of the North County campus 8" reflectors during a North County campus star party. First quarter Moon (inverted), November 6, 2008, photographed with a hand-held Panasonic Lumix LZ-8 through a Meade LX200 8" reflector at Cuesta College North County campus, Paso Robles, CA. Cuesta College Astronomy 210L students and guests (aka "Starry Night Gangstas") during a North County campus star party. A water manometer is attached to a flask containing a gas, where the other end is open to the atmosphere. [3.0 points.] How does the pressure of the gas inside the flask compare to atmospheric pressure? The manometer water level will be lower on the side that is at lower pressure, thus P_flask < P_atm. If the water levels were the same in either side of the U-tube, then P_flask = P_atm. If the water level was higher on the side of the U-tube open to the atmosphere, then P_flask > P_atm. [3.0 points.] How does the pressure at point  compare to the pressure at point ? According to Pascal's principle, "same fluid, same level, same pressure." In fact, P_1 = P_2 = P_atm. [3.0 points.] A uniform boom of length 1.20 m is held at an angle of 30.0° above the horizontal. A cable, at angle of 30.0° below the horizontal, is attached to the middle of the boom, and fastened to a wall. The boom is fastened to a hinge attached to the wall. Which is the lesser magnitude force acting on the boom? 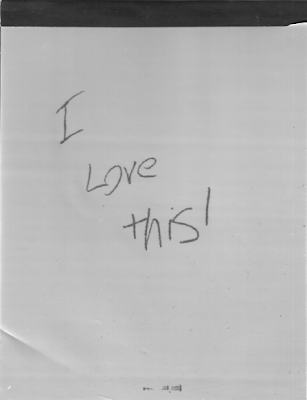 tau_weight = r*F_perp = (0.60 m)*w*sin(60.0°). tau_tension = r*F_perp = (0.60 m)*T*sin(60.0°). From inspection, the magnitudes of the weight and tension forces must be equal. Erasing slate: I love this! Models representing a negative curvature "open" universe, a zero curvature "flat" universe, and a positive curvature "closed" universe. The closed universe is constructed by removing two triangles from a flat sheet, and taping the resulting cutout edges together. These triangles are then taped into slits cut into another flat sheet, producing the open universe. The black-and-white inverted version of the same photo is shown below. (A) they began their main sequence lives in different spiral arms. (B) the supergiants have already exploded as type II supernovae, but this light has not yet reached the Earth. (C) they contain different concentrations of metals (elements heavier than hydrogen and helium). (D) they are both remnants of medium mass main sequence stars. Massive stars live for a brief amount of time, evolving rapidly from protostars to main sequence stars to supergiants to type II supernovae. At the other extreme, low mass stars live for an inordinately long time, evolving from protostars to the main sequence, where they all still exist to this day as red dwarfs. So in order for a supergiant to be located in the same spiral arm as a red dwarf, they must have been born in separate locations--the massive star is born, lives, and dies within the same spiral arm, while the red dwarf is on its nth round trip, passing through the spiral arm. Responses (B) and (C) are not an important factors, while response (D) is obviously false. (A) observing how quickly or slowly stars at different distances orbit its center. (B) observing how quickly the supermassive black hole at its center is growing. (C) carefully counting all the stars in the night sky. (D) timing all of the Cepheid variable stars in the halo. Kepler's third law would be used to determine the total mass of the Milky Way. (This clicker question sets up the introduction of dark matter.) Response (D) would determine the luminosity of the Cepheid variable stars, from which the their distances could be found, resulting in the distance of the sun from the center of the Milky Way. Response (B) is a somewhat fanciful notion. [4.0 points.] Which type of main-sequence star will eventually become a neutron star? "Mass is destiny." Massive stars will become either neutron stars, or black holes; medium-mass stars will become white dwarfs, while low-mass stars become (and remain) red dwarfs, at least for now, given the current age of the universe. [4.0 points.] Which type of main-sequence star will eventually become a white dwarf? Astronomy quiz question: red dwarfs as giants? (A) it is made of degenerate matter. (B) its core will never get hot enough to fuse helium. (C) it will never run out of hydrogen to fuse. (D) not a single red dwarf has died of old age anywhere in the universe. A red dwarf has a main sequence lifetime much longer than the age of the universe, so none have actually "died" yet. However, when all of the hydrogen in a red dwarf has been depleted, it will gravitationally contract, but not enough to increase the temperature for helium to fuse, so it will never restart fusion to become a giant, as a medium mass main sequence star would at the end of its hydrogen fusion lifetime. Student 1: "Wait...does that mean that the Moon is the Earth?" Student 2: "What? The Moon is the Earth?!?" Instructor: "Dude! The Moon is the Earth. Have another brownie."